Getting to the airport on time. Now, there's a nail-biting concept. Even if you set off with time to spare, there's still the traffic and weather to deal with. On the other hand, an overnight stay near Aberdeen airport means you can rest easy before your flight, especially if it's a very late or early one. The prices are nice too. Looking for the best deals on Aberdeen Airport hotels? Look no further! Here at UKACP we make it easy for you to arrange a stay at an Aberdeen Airport hotel. All you need to do is enter your details in our search box. You can also tick the boxes of the various facilities you require. We will then present you with the best results for your requirements. You can order the hotels based on what is most important to you – whether it is price, star rating, hotel parking or something else entirely. Comprehensive Hotel Information At Your Fingertips! We give you all of the information you need to make the right decision for you. From checking-in times to parking facilities, all details are presented to you. We even have some great walkthrough videos for you to watch. Once you have found a hotel you are happy with, simply complete the easy and quick booking process. We will then send you an email confirmation. Print this off and you are good to go. The Courtyard by Marriott is a good choice if you want to benefit from a hotel room with a good view of the airport runway. It’s a modern hotel with a convenient location. If you want to start off your holiday in style, Thistle Hotel is a good option. It’s elegant and impressive, with delicious dining options. The Britannia Hotel is a good choice for families, especially if you are searching for an Aberdeen Airport hotel with parking. This hotel is fully equipped with a gym, indoor pool, sauna and steam room. So there is plenty to keep you busy! Breakfast starts at 5.00 am, which is good news for early flyers. Courtyard by Marriott is a great choice for ultimate convenience. The hotel is within walking distance from the terminal. If you don’t fancy lugging your bags around you can catch the free bus from outside the hotel to the airport. 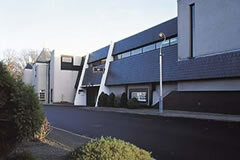 Menzies Dyce is another hotel with a free bus running to the airport. The bus runs every twenty minutes on weekdays. On weekends it is available on request. Don't forget that if you decide not to stay in a hotel the night before you fly you can still save money on our Aberdeen airport parking packages. We will always save you anything from 15 to 60% compared to the car park gate price.